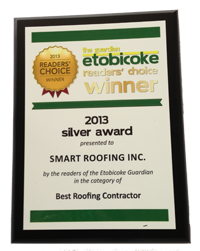 Voted Best Roofing Contractor in Mississauga & Toronto - Smart Roofing Inc.Smart Roofing Inc.
Smart Roofing has been awarded Best of the Best (Roofing Company Category) in the 2017 Mississauga News Readers’ Choice Awards, and is the Gold Readers’ Choice 2018 Winner for the Best Roofing Contractor category as voted by the readers of the Etobicoke Guardian, a local community newspaper in Toronto published by the Toronto Community News. Smart Roofing Inc. has been providing trusted and reliable roofing services for residential and commercial customers for over 15 years. We offer a 100% satisfaction guarantee with full service warranties. Insured, bonded and licensed, and all our roofers are safety-trained. Visit our online roofing quote form to get a roof estimate. Smart Roofing will be able to tell you the age and extent of any roofing problems you may experience. After determining the health of your roof, we then provide you with an estimate, as well as recommendations whether your roof needs any repairs, only minor repairs, or whether it needs to be completely replaced. Many property owners want to quickly know how much will it cost to repair or replace a roof. Unfortunately, there is no general answer to this as every roofing job is different. Many different factors have an impact on price, including the type of roofing material used, the size and pitch of the roof, and the location and accessibility of the property. Before Smart Roofing can properly give you a roof quote, roof contractors will physically visit your property and do a comprehensive measurement. Also, before any work is started, Smart Roofing employees will perform a proper roof inspection to ensure all potential problems are dealt with correctly and quickly so that they don’t start impacting other areas of your home. Smart Roofing Inc is a local roofing company that has had the privilege of serving over 3,000 happy families since 1995. We work hard to earn our great reputation and we invite you to read some of what our customers have said about us. I hired Smart Roofing for a complete roof replacement. 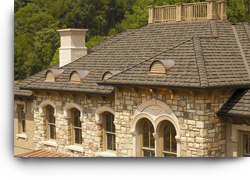 This company is one of most professional roofing companies out there. Jerry explained all the options which made our decision very easy based on the thorough information provided. The job was completed within a few days exactly as promised and with exceptional clean up. I will be recommending Smart Roofing to anyone in need of a quality roof. This company is really dedicated to quality work and customer satisfaction. I really enjoyed this company working on my house because they are very trustworthy and know what is best. My neighbour recommend this company for fixing my old roof ever since they worked on his house and hasn’t experienced a problem. All the workers are very friendly, and really are professionals since its been a while now and I have no problems with my roof anymore. They fixed all my prior problems for a good price and made great recommendations for me to avoid future problems as well. I would recommend this roofing company to everyone based on quality service! Our 10 year old home needed new (roof) shingles. Smart Roofing company came out and accurately measured and made economical and structural recommendations. Clean-up was excellent and job was done in one day. Bob came by and took a look at my roof. I needed a few missing shingles replaced. The job done the same day. I had phoned the company that did the roof 3 years ago and they had gone bankrupt. I phoned four other roofing companies. Bob called me right away. The repair was done quickly and in a timely fashion. We checked out all the advertisements in the neighbourhood and then our friends recommended Smart Roofing. They did an excellent job and recommended good shingles; very clean workers cleaned up every nail and did the job on time and within the price range we were looking at. In October 2010, Smart Roofing completed the roof re-shingling on our house at the agreed price in the time they stated and the work was done within 2 days. The roof is great, the workmanship is great, and they even made a small repair after reviewing their own work. I would not hesitate to hire this roofing company again. Many of my neighbours have also used them and that is why we chose Smart Roofing over other roofing companies. Smart Roofing is a roofing company that I highly recommend. Bob the salesman was very knowledgeable and very helpful with his suggestions.The quote was mid range from past experiences. I realized you only get what you pay for. The highly skilled crew worked with great pride. They gave me the impression that they were working on their own homes. What an example of SERVICE EXCELLENCE. We had had a terrible experience with a previous roofing job which was only 11 years old and already needed to be completely replaced. Jerry came by as one of four roofers we had quote on the job. He was courteous, prompt, specific and very experienced obviously. He gave us an estimate, replaced not only the terrible job that had been done before but damage caused to the boards of our home as well. He provided us at the estimate stage with clear menu-style pricing which broke out upgrades. The crew from Smart came when they said they would. They left my property cleaner than it was before (thanks guys!) and were done in one very long day. Their price was very fair – not the highest but not the lowest. And their guarantee they put in writing for 10 years and I have no doubt whatsoever that they will stand behind it. We are now planning to have Smart Roofing also replace our very old eaves in the early summer. I would not hesitate to recommend Smart Roofing and Jerry was a pleasure to deal with. Using this roofing company made this process less stressful and easier all around. They did a fantastic job and you have to like it when the owner of the company comes back and personally inspects the job himself before handing you the written guarantee. Fantastic job. Visit our online quote form to get a roof repair and replacement estimate.